The main objective of the paper is to introduce vehicular pollution monitoring system using Internet of Things (IoT) which is capable of detecting vehicles causing pollution in the emission test centers and measures various types of pollutants, and its level in the air. The proposed system also assures the existence of wireless sensors for vehicle pollution system that specialize in a straight forward accessibility of real time data through internet using IoT. The measured data is also shared to vehicle owner, traffic department. This system is a low cost and provides good results in controlling the air pollution especially in the urban areas. Wireless sensors are used in most of the in real time applications for collecting physical information. The impossible measurements in typical ways have currently become attainable using the wireless technology. In this technology, the measurement of air quality is one of the difficult areas for the researchers. The main source of pollution in cities is due to vehicles. The increase use of vehicles in cities results in vital increase in the emission load of various toxins into air. As a result increase in environmental problems which will affect the human health in urban places. Pollution discharged into the atmosphere by residential, commercial and industrial facilities. Automobile exhaust, or automobile emission, is a very large cause of pollution in developed countries and urban areas and results in global warming. Before we could drive our car we have to make sure it would pass an emission test. Our idea is to automate the existing emission test process.In the existing system, emission test center have to take a proper license from the concerned authority to conduct the test. But there are some loopholes in this system. Main drawback is thatwhen emission test centerconnect the device to the silencer of vehicle, emission test values which are given as input to the system are used to generate the certificate. But there will be an option to change the values and generate the fake certificate and take the printout there itself. But the question is: Are they really going to check the values according to rules and procedures(petrol and diesel) that are required to be followed? In addition to this the vehicle owner can give bribe to the person who generate the certificate by adjusting the values.So we want to automate the system in the IOT environment and authorize server and there should be one authority so that even that authority have no option to change the values. The authority can only see the vehicle and vehicle number at the place where it is tested. At the authority there will be a person who just say accept or reject. Internally the values are checked according to the standards based on the type,model and an email of certificate is sent to vehicle owner and he can download it anywhere,ascertificate is publically available in cloud. If the certified authority(CA) come to know that the vehicle has not passed the emission test they can take the necessary action like charging fine,cancelling the insurance etc. If the person want to run the emission test centre,he should send the request to the CA and he should the guarantee the infrastructure and can run the emission test center. 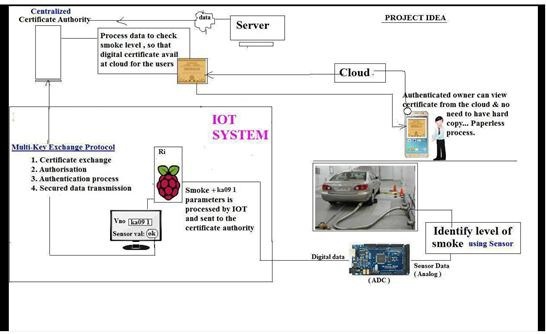 This project is to develop secured mechanism of collecting the sensor readings using MQ2 smoke sensor thus avoiding any third party intervention at the emission testing agency. The sensor readings and the vehicle number is encrypted in the Arduino using RSA cryptosystem. The encrypted data is sent over cloud to the Certified authority(CA) for further processing and certificate generation CA ensures the authenticity by comparing the received owner details with the one in the CA database. Certificates are generated according to the test results. The IoT-based emission test system produces authentic digital emission test certificates. The objective is to overcome some of the disadvantages of the current emission test system where the sensor values are easily altered in the certificates in order to avoid vehicle servicing overhead in case of exceeding the standard emission threshold. The current system of emission test certificate generation requires manually collecting the sensor readings and generating paper-based certificates where the veracity of the information on the certificate is not ensured. 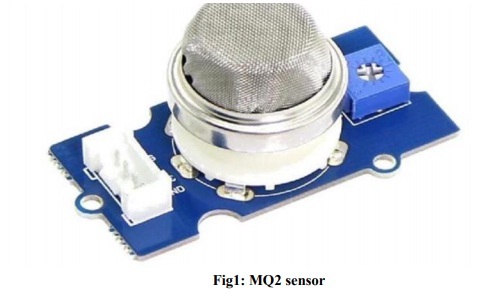 This idea is to develop secured mechanism of collecting the sensor readings using MQ2 smoke sensor thus avoiding any third party intervention at the emission testing agency. MQ2 as shown in fig 1 is suitable for detecting H2, LPG, CH4, CO, Alcohol, Smoke or Propane. Due to its high sensitivity and fast response time, measurement can be taken as soon as possible. The sensitivity of the sensor can be adjusted by potentiometer. The Arduino Uno is a microcontroller board. It has 14 digital input/output pins (of which 6 can be used as PWM outputs), 6 analog inputs, a 16 MHz crystal oscillator, a USB connection, a power jack, an ICSP header, and a reset button. It contains everything needed to support the microcontroller; simply connect it to a computer with a USB cable or power it with an AC-to-DC adapter or battery to get started. The sensor readings and the vehicle number is encrypted in the Arduino using RSA cryptosystem. The encrypted data is sent over cloud to the certifiedauthority (CA) for further processing and certificate generation CA ensures the authenticity by comparing the received owner details with the one in the CA database. Certificates are generated according to the test results. System will ensure the integrity of collected readings by suitable data encryption and directly sends it to the CA, hence avoiding any kind of manipulation. Vehicle and owner details presentin the CA helps to verify thereceived data for authenticity. Since there is no way of altering the sensor readings at the center or at the CA, malpractices in the existing system can be prevented leading to minimizing the pollution in the environment. 1. A regulated power supply of 5v or 12v must ensure the operation of smoke sensor arduino kit. 2. The centralize authority must be able to accept or reject the requests from the emission test centres to authorize them to conduct tests. 3. The entire sensors used to calculate the concentration of gases must be able transmit the data to centralized authority. 4. The data captured from the sensors should be transferred to the cloud without fail. 5. The centralized authority must be able to accept or reject the request for certificate from client by retrieving values from the cloud storage. 6. Provision should be provided to notify when the traffic authorities feel immediate action is needed for the vehicle causing pollution. 7. The concerned users should receive an email of the test results in the form of pdf. It is used to identify the level of NO2 emitted from vehicles. It makes all the certificates digital to achieve paperless work and also maintain authenticated and authorized process. Managing the centralized system in simple and efficient way. This is the most secured contribution to smart city. The proposed system has not implemented image processing at CA to verify the authenticity and hence requires an administrator to approve or reject the generation of the certificate. This feature can be considered for the future work. induces automation and digitization. Secondly, the system ensures integrity and authenticity of data. This improved mechanism will help in controlling the amount of smoke emission through vehicles into the environment and gradually will help reduce the air pollution that is one of the major environmental issues. Sneha S. Kamalakar, Mousami S. Vanjale,” Notifying and Inspecting Vehicle emission and Temperature of vehicle engine”, IEEE Conference onEmerging Devices and Smart Systems (ICEDSS 2017) 3-4 March 2017, Mahendra Engineering College, Tamilnadu, India. K. Srinivasa sricharan, M A Arun Srinivasan, S sushanth kumar, “An intelligent automated emission quality monitoring system designed to test the in the signals”, 2013 International Conference on green computing, conversation of energy. Shuofeng Wang, Zhiheng Li, Member, IEEE, Jiyuan Tan, Wei Guo, and Li Li, Fellow, IEEE,” A Method for Estimating Carbon Dioxide Emissions Based on Low Frequency GPS Trajectories”, vol. 14, no. 3, pp. 1449–1461, 2013.